Nestled away in the hills of Vagamon, Little Flower Farms is a gorgeous hideout which has a secret spring pool and a deck that overlooks the valley. For anyone who finds Munnar too touristy, Little Flower Farms' untouched patch of green in Vagamon is perfect. Once a farmhouse, the eco-friendly homestay is palatial, ancient and surrounded by spices, fruits, vegetables, and the local avian and animal folks. Not that you will stay indoors much, but the homestay comes with four rooms, which can all be booked out if you are planning a family (or squad) vacation. Want to wake up with a view? Take the rooms with the large glass windows and balconies that offer you unending views of the greens and the hills in the distance. 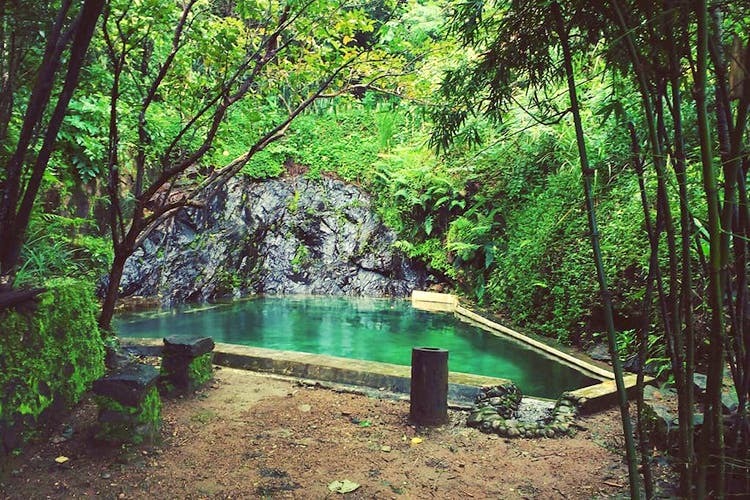 The best part of the homestay is exploring the space around and dipping your toes in the chilled spring pool that's hidden away in the greens. The water is as clear as it can get! Come evenings, a bonfire by the edge of the homestay can be arranged. What's better than a bonfire under star-lit skies, right? Mornings can be spent hiking up the various trekking trails or going on a botanical tour. For meals, head to the thatched roof patio that serves authentic Syrian Christian cuisine centred around fish, farm fresh vegetables and fruits. Don't miss out on the paragliding experience hosted by Fly Vagamon that happens between September to January and March to May.